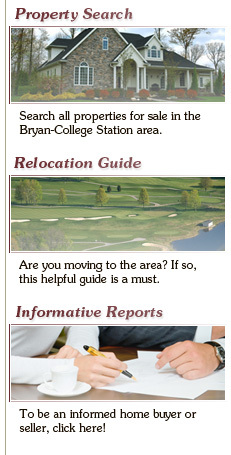 As a former student of Texas A&M and a Bryan-College Station real estate expert since 1987, Phil Callahan has what it takes to help you make a smooth transition to this wonderful community. Phil loves introducing newcomers and retirees to all of the various opportunities and traditions that go along with life in Bryan-College Station. Contact him today to make the most of your next move. You’ll be glad you did. Phil invites you to click through his website filled with multiple tools and resources for homebuyers and sellers. Learn more about Phil and his real estate services. Search for homes for sale, order informative special reports that could save you thousands. If you are relocating to the area, you’ll find a wealth of information too. It’s all here in Phil‘s website.